Not helpful, right? 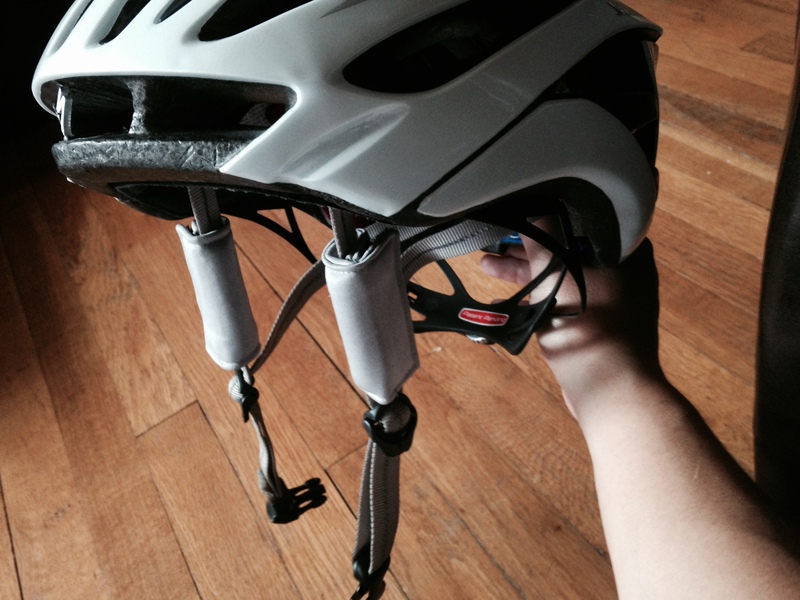 So when I was contacted by the folks at Wind-Blox about reviewing their helmet strap attachments, I wondered whether this simple add-on would save me some frustration when riding with club-mates who just love to yell, but whose voices are always masked by wind noise. 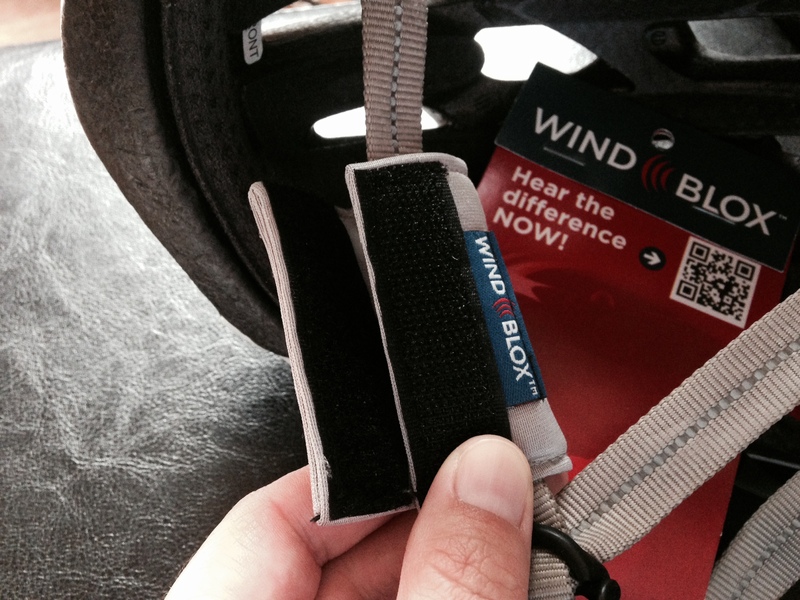 If you haven’t heard of Wind-Blox, let me explain. You merely affix these foam-filled cylinders to your helmet straps in front of your ears, and they stay in place with velcro fasteners. This is simplicity in design, but I did find a slight learning curve to affixing the Wind-Blox properly at first. Affix the Wind-Blox with the flap facing the back. Like I said, there’s a learning-curve here (or I’m a little OCD about getting things to match up properly). Each side has a logo tab, which I was initially confused by–yes, my OCD wouldn’t allow one to read upside-down or backward. But I learned to get over that . . . sort of. 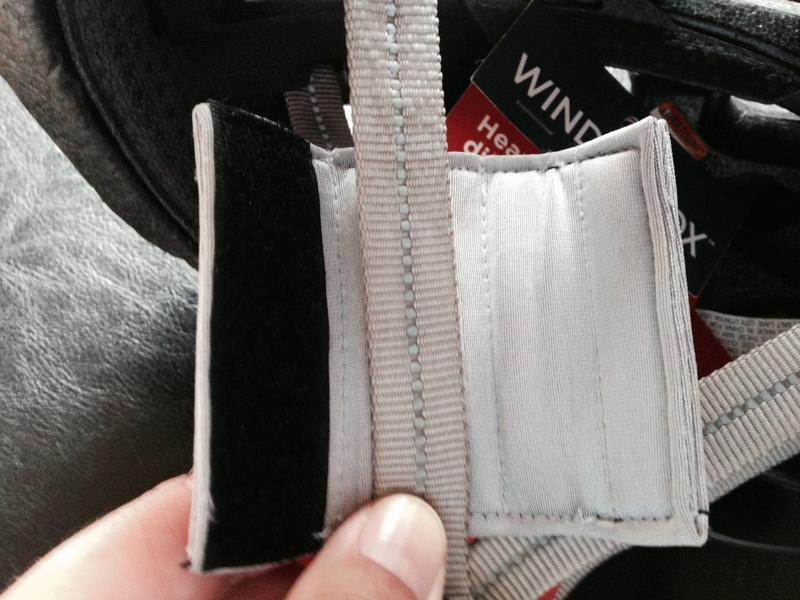 Left Strap: Start by unfolding the Wind-Blox, and lay it flat with the label facing away from you so that the soft side of the velcro faces up and to the left. Fold over the right side until you can see the logo and the rougher velcro. Then, velcro it all together. Boom! You did it. OK, if you didn’t get that, I’ve put it in pictures below. Now just repeat with the right side. So Now What? Do They Work? When I first got the Wind-Blox set up, I had a little trouble getting them to sit under my sunglasses comfortably. But with a little adjustment, they fit fine. I did wonder whether these might position a bit better on a man’s face. I like a snug strap fit under my ear, and it doesn’t leave a whole lot of space for the Blox. If you’re wondering, the ones I received measured about 2 and 3/4″ in length. On a woman’s face, this makes for a fairly tight fit. But I think I might just be nit-picking a bit too much here. Setting off on my ride, I didn’t notice much wind reduction at first. It is quite important that you play with the fore and aft position of the straps until you can physically hear the lessening of the wind noise. I pulled them further back over my ears, and then they started to work. While I had somewhat unrealistic expectations of these completely shutting out the wind, they work more like a dampening flap. I rode alongside my husband, and I could definitely hear him speaking to me more clearly than without the Wind-Blox. One caveat here, however. At low speeds (we’re talking 8-10 miles per hour . . . was that a pun? Hmmm.) the noise dampening was not nearly as noticeable as at higher speeds (17-25mph). So it may hit that sweet spot for serious cyclists and triathletes who are training at higher average speeds. Traffic noise was certainly more noticeable with the Blox. I could tell when a car pulled up behind me more easily than without them. It definitely increased the distance at which I could hear the vehicles behind me, but not by a great deal. 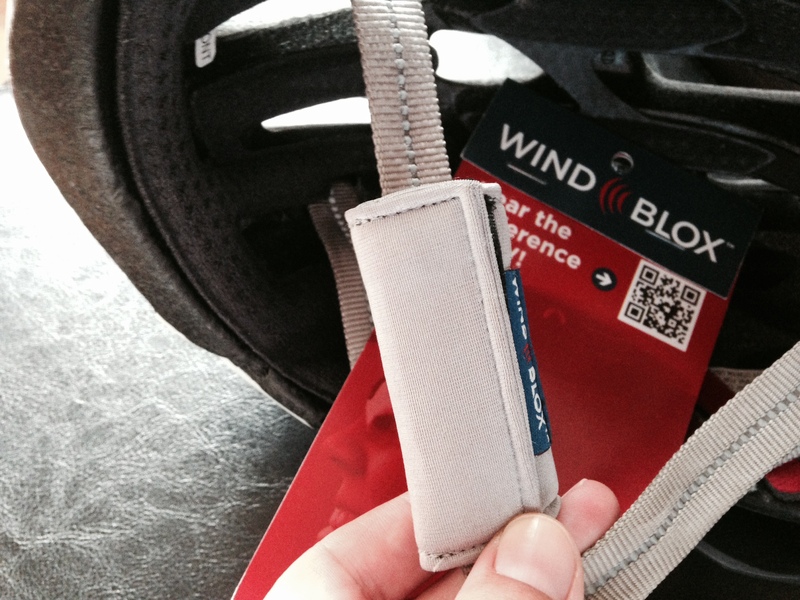 If you’re after a product that will increase your awareness of the cars around you, and you want to hear the pack chatter during a group ride, Wind-Blox are for you. Although my inner bike snob balked at first with the new flaps over my ears, they weren’t quite as noticeable to others as I felt they were to myself (at least that’s what my husband said). But the increase in safety is probably worth the self-consciousness I experienced while wearing them. I chose the relatively muted gray color, and the kind folks at Wind-Blox surprised me with both a gray and a black pair. But Wind-Blox come in four colors: black, gray, pink, and neon green. I have to admit, I was kinda tempted by the green. At $15 per pair, these are a relatively cheap and simple accessory that will help keep you safer on the roads.